Balancing Jane: Romney Voters, A Word, Please? Look, I don't need you to like Obama. I don't even need you to vote for him. And if you really, really want to vote for Mitt Romney, then--by all means--practice your right to vote and go do what you need to do. But if you do that, then there is one thing I need from you. Please, if you elect this man, if you promote this man, if you ascribe to this man's philosophies, please think through and then hold him accountable for this utterly insane stance on birth control. In Tuesday's debate, a question about fair pay segued into birth control. 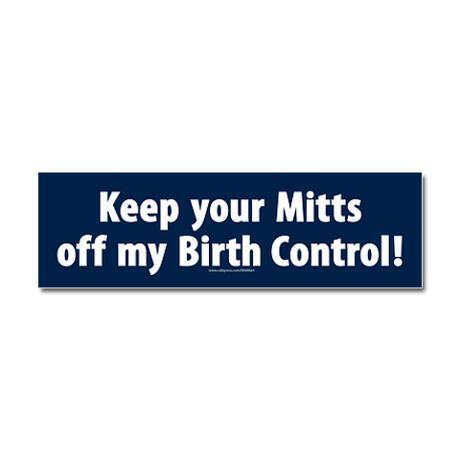 Some have accused Obama of changing the subject to hit Romney in a vulnerable place but we need to hear Romney's stance on birth control because what he's said in the past has not been very promising. And secondly, Obama's connection wasn't a reach; he was spot-on. Birth control is an economic issue, for individuals and for the community at large. And that is a pocketbook issue for individual families. Birth control is not cheap, and it is most certainly a health issue for women. Romney's current position on abortion and birth control is a complete 180 from the one he held not that long ago. He's lying. He's either lying now or he was lying before when he said that he would cut off funding for Planned Parenthood and that he would support the Blunt Amendment (making it legal for employers to deny birth control coverage under their insurance plans). I suspect he's lying now, and--regardless--someone who would attack my right to reproductive health just to get conservative support is not someone who can be trusted in a position that actually impacts my reproductive health. I might be about to overshare about my own reproductive choices, but I've decided that if our rights are going to be up for public debate, then talking about the way those rights impact us is a necessary way to combat it. When Mitt Romney and the Republican platform says that they want to eliminate the coverage of birth control in insurance plans while simultaneously defunding Planned Parenthood, they are essentially telling me that I have no control over when or if I get pregnant. My insurance paid for my birth control, an IUD that I could not have afforded out of pocket. I had just had a baby, and I was already paying for new cribs and breast pumps and clothes and diapers. The IUD was the most economical option because I knew I wanted something long-term, but it had the most up-front cost. At the time, I was employed by a university with religious affiliations; they very well could have opted out of covering this procedure if the Blunt Amendment had been in place. And here's the thing, birth control is an economic issue for me not only because I have to pay for the actual birth control (which is one of the most important parts of my personal health plan), but also because I cannot afford to have another child right now. And I'm in an extremely privileged position. I am married, work full-time, have health insurance, have a husband who works full-time who also has health insurance, and we live in a place with low cost-of-living. I am educated and have marketable skills. I am lucky and grateful. But I still can't afford to have another baby now. I haven't been at my current job long enough to qualify for FMLA, so my job would be in jeopardy if I became pregnant. I could not afford--even with my job--the cost of daycare for two children without seriously sacrificing the quality of my child(ren)'s care. I would not be able to do the work I am doing now--finishing my PhD and teaching full-time--with an infant and a toddler. And everything--from the size of the houses I could potentially buy to the zip codes I would consider living in because of schools--would be impacted by a decision that was outside of my control. So, yes, access to birth control is an economic issue. My entire life would be thrown into upheaval if I could not control my reproductive choices. In addition to being completely out of line with his previous comments, this statement also has a hedgy phrase: "Every woman in America should have access to contraceptives." Just what is Romney calling access? Does he think that women should have access to contraceptives the way that I have "access" to Lamborghinis and Rolexes, that is, that they exist in the same world that I do and I may occasionally see one? "Access" can not just mean hypothetical ability to obtain. Access must mean actual ability to obtain. His talk of defunding Planned Parenthood--which even in the debate he did not take back--seriously jeopardizes that ability for women all across the country. And this is where the economic issue becomes more than individual. Let's be real. Babies are not free, and unwanted babies are not somehow more affordable. How do you think that women who cannot afford birth control are going to afford a delivery of that child, let alone the costs of raising him/her? A 2007 study found that unintended pregnancies cost the U.S. $5 billion in direct costs in 2002 and that the use of contraceptives resulted in a medical cost savings of $19 billion dollars. A more recent 2011 study (that calls its estimates "conservative") suggests that unintended pregnancies cost the U.S. $11.3 billion a year. Mitt Romney has singled out Big Bird (and public broadcasting in general) as a place that needs cutting to save money, yet it costs only $445 million a year. To put it another way, you would have to fund public broadcasting 25 times to make up for the cost of unintended pregnancy. What, exactly, is the fiscally conservative argument for eliminating this necessary health service? I know the world is a big place and that we all make decisions based off of our unique perspectives. I am not going to say that any woman who votes for Mitt Romney is an idiot, as I've seen plastered across message boards time and time again over the last few months. We all have our reasons for making the choices that we make. All I'm asking is that, please, if your choice is to elect this man that you consider the impact that choice has on women for whom birth control is not some hypothetical hot-button issue, but a real medical necessity that impacts our everyday lives. I thought after the big hoopla with the girl who testified to congress that they had gone to the Target down the street from the university she attended (which costs like 40-50k a year) and got a months supply of birth control pills for 7 dollars? That doesn't seem like an aweful lot to me. It's interesting to note how much unintended pregnancies cost but I doubt that cost would be much affected even if we provided all women with free birth control. There is some segment of the population that just doesn't care to control their reproductive health. So by that logic, any medication that can be filled through a generic discount program at a chain store does not need to be covered by insurance? Also, the cost of generic pills fails to take into account the exam and doctor's visit to prescribe them, something cutting Planned Parenthood would definitely jeopardize. And not all women can (or want to) take the pill. I certainly can 't go buy an iud at Target for $7. The bottom line is that I pay a health insurance premium every month and reproductive health is my number one concern at this point in my life. My employer should not have the right to dictate choices about my health that should be between me and my doctor. "I doubt that cost would be much affected even if we provided all women with free birth control. There is some segment of the population that just doesn't care to control their reproductive health". This is an easy question to answer: look at the other western countries that provide either free or low-cost birth control (like the UK and Sweden just to mention two I know for certain). They have a fraction of the number of unwanted pregnancies compared to the US. And probably a fraction of the related cost. You have a great point Jane, in terms of not all women being able to take the pill (I'm one of them for example). This has completely been missing from the overall discussion. The best, safest and least invasive types of birth control are the ones that have a high up-front cost like the IUD or the stick in the arm. These need to be promoted and subsidized for a better long-term economical benefit (not to mention quality of life!). I've been trying various hormonal contraceptives (off and on, but more on than off) for the past 16 years. A few months ago, it seems, I finally found one that doesn't aggravate my endometriosis symptoms. According to my pharmacy receipt, it retails for around $100 a month. Which, before my insurance started restructuring things on account of the Affordable Care Act, it was completely out of the question.